As usual, the school holidays arrive too quickly. Many families pack their togs and head north to warmer climes. However, we parsimonious contrarians pack both the puffer and rain jackets to take the kids the furthest south they have ever been, across one of the roughest straits in the world in search of clear air, prehistoric forests, isolated beaches and a national icon on the Rakiura Track, Stewart Island. Driving south into a stiff southerly and with the Foveaux Strait predicted to have a 3m swell, our motion-sensitive crew down a round of seasickness pills to raise fortitude to deep south levels. They’re really just industrial-strength antihistamines, so we hope for quieter kids as a side effect. No such luck but we do make it across the strait with breakfast still on board. The ferries are sleek, fast catamarans that slice through the swell with ease and can go in most conditions. One of the crew reports our trip is about a three out of 10 in terms of conditions that they can go in. If you like thrills, the ferry trip in a big storm would turn into a hour’s theme-park ride that would be hard to beat. For those travelling with kids, Real Journeys, who run the ferries, very generously let all school children travel free during holidays. There are daily flights in a very small plane from Invercargill Airport as an alternative, but sometimes a no-less-bumpy means of access. 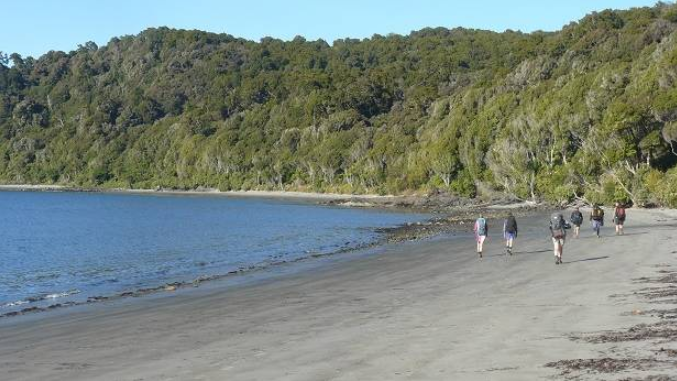 The Rakiura Track is one of 10 Department of Conservation Great Walks. It’s a 32km loop walk from the main town of Oban, generally done in three days, although speedsters can whip around it quicker. It’s very accessible for families and those who are just starting out with multi-day hikes, as the days are generally easy and the track is relatively flat compared to some of its mountainous cousins. What it lacks in scale, it makes up for in the variety of terrain, the pristine environment and sense of isolation. You can’t go much further than this. Once off the ferry, it’s a 5km walk to the start of the track at Lee Bay, or a quick trip in a shuttle, which we do to save our kids’ legs for the main event, passing whitebaiters and a snoozing sea lion on the way. The 8km-long first day follows the northern coastline with views out on to a lumpy Foveaux Strait. One surprising feature of the walk is the crystal-clear azure waters and golden-sand beaches along this part of the coast. If you squint your eyes, forget you are wearing thermals and a jacket and there are no swaying palm trees, you could imagine you are in a tropical paradise. Despite looking inviting, the 12C water temperature ensures swims are short and very refreshing, as my daughter can attest. observing, talking and playing games to pass the time as we drift along. Our busy lives at home mean it is rare to get such concentrated time as a family together. Our first night’s stay, Port William Hut is in a sheltered harbour that Māori have been coming to since the 13th century. The gum trees in a national park are an unusual sight but a relic of a European settlement attempt in the 1800s. The hut fire is cranking and we are warmed up in no time with the kids being entertained playing card games with a fast-talking university student from Idaho, while we drink tea and read. Our fellow walkers split into two camps, those who are willing to chat and share their stories and those who want to remain in their own silos. The latter keep looking sideways, incredulous as to how it is possible for four kids to make so much noise. Food always tastes better when you have carried it somewhere to build up your hunger. Despite this, some of our freeze-dried meals are closer to the catfood end of the delicious scale. Food is also a source of much envy and bitterness as, inevitably, among the dozen different meals cooked, the smell of frying garlic or bacon wafts over to taunt your senses. Despite rain in the night, the day dawns bright as we embark on the crux day, 13km or six hours of bush and hills through from the coast to Paterson Inlet and the North Arm Hut. For a Great Walk track, its condition is pretty varied with some very muddy, kids’-shoe-swallowing patches, as well as, unusually for a national park, a lot of plastic matting. The bush, however, is beautiful and varied from dense dripping scrub to wind-sculpted trees on the ridges to prehistoric fern-carpeted, open old-growth forest. The hut has a great view out over the shore of the inlet, where the the kids harass the local crab population for the afternoon. Stewart Island is almost as good a place as there is to see our national bird in the wild. I come across one on our first day, when on an evening run, and one of our fellow hut-mates comes across half a dozen near the North Arm Hut while out spotting with a torch near midnight, the most common way of seeing these nocturnal birds. We have given up hope of the kids meeting a live national icon when we set off on the 11km (four-hour) last day’s walk back to Oban around the bays on the north side of Paterson Inlet, particularly as it’s daytime and a key factor in improving your chances of seeing them is remaining quiet. But, having heard a rustle in the bushes just next to the track, I call a halt. We all freeze in uncharacteristic silence. Then, out from the ferns on the side of the track comes a large and very curious kiwi, walking right up to our feet in search of grubs. We spend a delightful 10 minutes watching and hanging out with this amazing bird as it pecks around, searching for food on the forest floor. An absolute joy to see the excitement on the kids’ faces and a great memory for us all. We make it to town just as the rain arrives, so go for a round of drinks and chips at the world famous South Seas Hotel to celebrate our accomplishment, a bastion of island hospitality and source of many an embellished yarn. By the time our ferry is due to leave, the storm has heated up 40 knot winds and a 4m swell on the strait.